Wesley So: I agree. But today I played very well against Gata Kamsky. I was preparing to the game. I caught him at the opening and he spent a lot of time. I just hope that tomorrow I will be also lucky. Q: How can you cope with the magic of the big chess names? 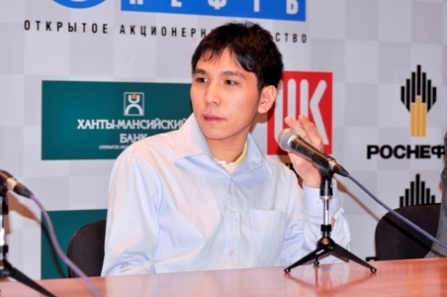 Wesley So: I realize that you should do your best in the classical games of each round. If you win one game, you are almost there. Besides, I spend a lot of time for preparations to every single opponent. I train chess for 5-6 hours per day watching the previous games of my opponents. I understand that they are people who can also make mistakes. Q: Do you have a special strategy to play in the Cup? Wesley So: Generally speaking, I am ok if the classical games were drawn. Here the tiebreak goes. To my mind I play tiebreaks better than classical games. But my opponents did not give me any chance to come to the tie breaks. Q: Tell us about yourself? Your achievement in chess? Wesley So: I am 16 and the greatest achievement for me so far is the second place in one tournament with average rating about 2700. At the moment my rating is 2640. I dream that sooner or later I will come to the magical point 2700. I don’t know how much time I will need for that. Q: Are you planning to participate in the World Junior Chess Championship? Or you are not interested to play against the opponents of your age? Wesley So: It would be stupid of me to think that due to my performance here I became a big shot. In fact to win the World Junior U-20 Championship is my nearest aim in chess. It will be a tough competition. Some of the potential participants of the Championship are here: Negi Parimarjan, Hou Yifan, Sanan Syugirov. I am trying to follow their games here, their openings most of all. Q: How can you define your chess style? Wesley So: So far I play aggressively. I would like to play a solid game with a solid opening. This is what I want. I think my style is close to Vishy Anand. Of course we have different level. Q: Do you have a personal coach? Wesley So: Unfortunately I don’t. But I think that the moment is coming: I will need it soon. I would train chess with Sanan Syugirov with pleasure for instance. He is my age. The only problem he does not speak English. Anyway I feel like having an assistant now. Another problem is that chess in not that famous in the Philippines . We don’t get any financial support from the Government. They don’t give money for tournaments, coaches, nothing. Our national federation pays our tickets. That’s it. You realize at one moment that to reach some professional level you need private sponsors. I would be happy with some 20-30 thousand US dollars a year. Q: This is your first visit to Russia . Aren’t you afraid of cold weather? 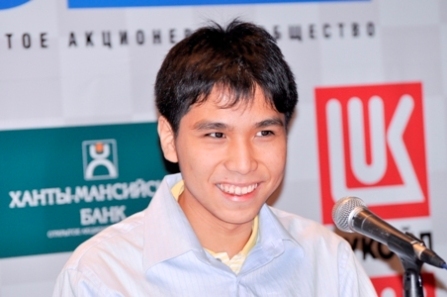 Wesley So: I opened Siberia for myself. It is very beautiful place with good people! Yes, it is cold here. But we come from the Philippines, we like to visit countries where it is colder than in our country. Of course truly speaking minus 30 is too much. I like Siberia , but I prefer to stay in my room when it is so cold.